Have you ever considered using collective singing to contribute to the integration of young people with migration background? Seems too complicated? You don’t know where to start? Don’t worry, “Sing Me In” is here to guide you! The partners of the project will present the free “Sing Me in: Repertoire Guide”. This repertoire guide is a companion to the three handbooks developed in the frame of the project. It gathers repertoire ressources that can help you work with young migrants. 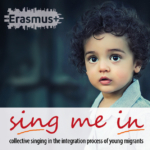 The “sing me in” project is supported by the ERASMUS+ programme of the European Union.